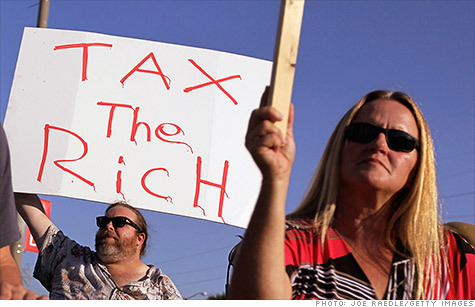 Taxing the rich: What's fair? All major tax changes have followed public debates about tax fairness. Now we're having another one about how much to tax the rich. Joseph J. Thorndike is a contributing editor at Tax Analysts and a columnist for Tax Notes magazine. His new book, "The Fair Share: Taxing the Rich in the Age of FDR," will be published later this year by the Urban Institute Press. There are actually two "how much" questions at play here. How much income does it take to be rich? And assuming you qualify, how much should you be forking over to the government every year? Lots of politicians are prepared to answer these questions. President Obama, for instance, thinks anyone making more than $1 million a year should pay at least 30% in taxes (the so-called Buffett Rule, after billionaire investor and eager taxpayer Warren Buffett). More broadly, Obama would let the Bush tax cuts expire, pushing the top income tax rate to 39.6% from 35%. Republicans tend to disagree with these proposals. Mitt Romney, for instance, would start by making all the Bush tax cuts permanent. He would then cut rates by another 20%, bringing the top rate to just 28%. So who's right, Obama or Romney? Both. Or neither. Take your pick, because when it comes to taxing the rich, there is no single, objectively correct answer. You can talk all you want about asking rich people to pay "their fair share," but don't kid yourself: You're just trying turn private opinions into public policy. On the other hand, don't be shy about those opinions, either. Historically, they've been crucial to the development of the federal tax system. Until the Civil War, for instance, almost all federal revenue came from tariff duties on imported goods. But in 1861, complaints about these regressive taxes prompted lawmakers to create the first U.S. income tax. The new tax, they insisted, would make the revenue system more fair -- especially crucial in the midst of a civil war. That first income tax disappeared in the 1870s, but four decades later, Congress brought it back during another argument about fiscal fairness. And this time, the levy stuck around. The most important tax fairness debate of the last century took place during World War II, when lawmakers transformed the income tax from a rich man's burden to a middle class millstone. Desperate for "taxes to beat the Axis," lawmakers added millions of previously-exempt taxpayers to the rolls. This wartime bargain remains largely intact some 60 years later. But here's the thing that drives conservatives crazy: The graduated rates at the center of this bargain are totally and utterly arbitrary. Scottish economist J.R. McCullough made this point centuries ago: "The moment you abandon . . . the cardinal principle of exacting from all individuals the same proportion of their income or their property, you are at sea without rudder or compass, and there is no amount of injustice or folly you may not commit." Modern conservatives tend to agree. "Establishing a graduated rate scale and setting the top marginal rate on that scale are inherently arbitrary tasks," Kip Hagopian wrote in a 2011 article for the Hoover Institution's Policy Review. Talking about anyone's fair share, he added, is an "invitation to abuse." Perhaps. But Americans have been offering that invitation for decades. "Fair share" rhetoric has been a fixture of federal tax debate since at least the 1930s. And somehow -- or at least so far -- the nation has managed to survive. That's probably because all tax systems, including our current one, are based on a variety of arbitrary opinions and intuitions. We rely on the political system to sort out these opinions in some reasonable fashion, avoiding "abuse" and approximating "fairness." But let's be honest as we enter yet another round in this endless debate. The starting point for any discussion of tax fairness should be a confession: We are just making this stuff up.